Autumn Ridge Stone is a distrubtor for the Holland, Grand Haven, Zeeland and West Michigan areas for retaining wall products from Borgert retaining walls, Rockwood retaining walls, and Allan Block retaining walls. Borgert "Panomur" retaining wall block is lightweight block that has a hollow core and a unique securelug connection. Click Here to find out more info on the panomur retaining wall block. Specs: 6" height x 16" wide x 12" deep. Only weighs 45# combared to other blocks around 65# a piece. E-Z Wall II Garden Walls. E-Z Wall II retaining wall block. Nice garden wall block to create retaining walls with curves or straight walls. Click here to learn more about the EZ Wall block. Specs: 4 1/2" height x 8" wide x 9" deep. 23# per piece. Cabinstone is easy to install with a back lip to secure the block without pins or mortar. 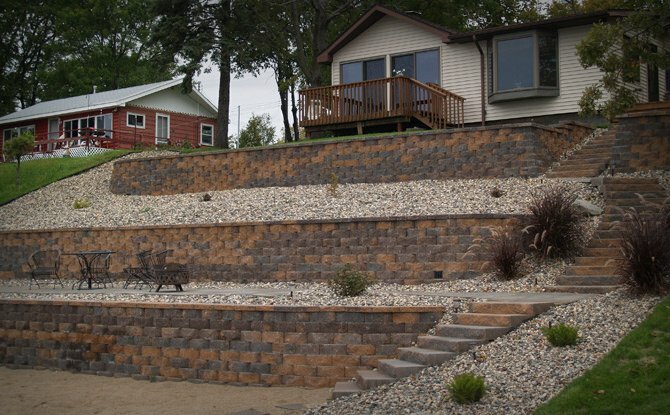 Click here to learn more about the cabinstone retaining wall system. Specs: 4" height x 12" wide x 8" deep. 26.5# per piece. Classic 6 system is a professional designed wall system with good curb appeal. Comes in a straight face or beveled face. Click here for more information on the classic 6 retaining wall block. Specs: 6" height x 18" wide x 12" deep. 63# per piece. Classic 8 system is a professional designed wall system with good curb appeal. Comes in a straight face or beveled face. Click here for more information on the classic 8 retaining wall block. Specs: 7 5/8" height x 18" wide x 12" deep. 80# per piece. Autumn Ridge Stone & Landscape Supply Inc. Hours M-F: 8:00 A.M. - 4:00 P.M.